We were blessed with a warm winter day today. Low 70′s without a cloud in the sky. I had promised the kids we’d go get their haircut today and they made sure they reminded me each and every day for the past week. It wasn’t so much they wanted their haircut, they just wanted the lollipop that comes at the end. Afterwards, we headed across the outdoor mall and dined at Hot Dog on a Stick. After wolfing down our food and lemondade, I wiped up some ketchup-smeared faces and we headed over to the oudoor fountain. This was the highlight of the day and the kids were so excited to run free through the fountain. I had packed an extra shirt for each along with a towel but that was it. I asked them not to get drenched. “Just run around the water shoots, okay?” I implored. “Okay, Daddy.” They dutifully replied. Apparently my definition of “drenched” and their definition are not one and the same. Oh well. We survived and it was really nice to sit in the warmth of the sunlight and watch Swee’Pea and TheMonk squeal with laughter. Something that hasn’t been heard in spades lately. The past few weeks have been as big a roller coaster as you can imagine. The lows, frankly, have been incredibly low but today I got a high that made me smile all day long. This morning I sent out an email to 500 people (it would have been more but I didn’t know gmail cuts you off at 500 emails a day) that have commented or emailed me regarding this blog. After thanking people for their support, I did something that doesn’t come easy for me. I asked for help. As you may or may not know, I’m an Executive Director of a YMCA here in San Diego. We serve a low income community right along the U.S./Mexico border. February is our large fundraising effort and because of my current circumstances, I’m a bit behind in my fundraising efforts. So I decided to start an on-line auction and I asked those in my email to contribute and item big or small that could be auctioned off. The response has been amazing. So far I have had offers from over 50 people to donate items. I am so grateful and honored that so many people would want to help me. I am in total awe of the generosity of people I have never even met. I cannot say thank you enough. A cruise for two, including airfare, aboard ShipRocked. A blog makeover courtesy of the lovely ladies at Catapult Web Development. A Mets game with one of my favorite Dad Bloggers, Looky Daddy. One pass to the BlogHer 2009 conference. 15 lbs of cookies from blog royalty, Bite My Cookie. Ad Space on two Rockstar Mommy Bloggers, BusyMom and Sarah and the Goon Squad. Autographed books from some great authors. Once I get a detailed list (It’s hard to email those who donated back since gmail shut me down for 24 hours) I will add a page to my blog that lists everyone and every thing. Again, I can’t say thank you enough to those who have donated. If you would like to donate something, please contact me at the email address in my sidebar. If you’d just like to bid on things, stay tuned. Details are coming. The year 2009 is all about change. We will have a new President who campaigned on that very notion. It got me thinking about what I want to change in 2009. Personally, I want find more ways to exercise. I want to be a better husband. And I want to eat less sweets. And then there is this here blog. In the early days of this blog I wrote about parenting and my experiences and thoughts regarding fatherhood with a little bit of everyday life thrown in for good measure. Over the past year or so, I changed the focus and began writing solely about Swee’Pea and TheMonk. My intent was to have some great stories about their toddlerhood that they would have and take with them into adulthood. But, the danger in only writing about Swee’Pea and TheMonk, I have come to find out, is that there is only so many times I can write about TheMonk talking about poop. So, I’m going to expand a bit on this blog. I’ll talk about everyday stuff but most notably, I’ll talk about myself. It dawns on me that one of the reasons I write this blog is for my kids to know how much I love them and how much I enjoy being their father. But I also want them to know about me. Who I am. What I like. Dislike. So in 2009 you’ll see some changes on this here blog. But hopefully for the better. And I promise I won’t write so much about poop. 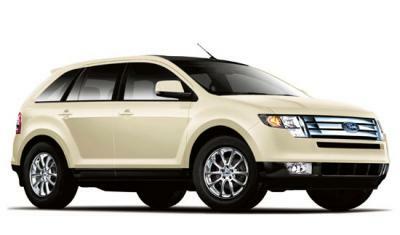 I bought the 2008 Ford Edge. I first got introduced to Ford when they asked me to test drive the Ford TaurusX last year. I liked it so I went back. Besides, I had two basic criteria when choosing a car. First, whomever I bought it from, I wanted the company to be around next year and Ford seems to a step ahead of the other American car makers. (We wouldn’t want those three-year warranties to be worth as much as Lehman Brothers stock now would we?) Second, I wanted a stereo that would play my iPod. I know. I’m such a girl. When it comes to cars I have no knowledge of engine stuff whatsoever. Even now, the engine could be powered by chipmunks and some rubber bands and I wouldn’t know it. Anyway, I bought it on Tuesday and brought it home in the afternoon. When I got there Swee’Pea and TheMonk were napping. TheMonk woke up first and staggered into the living room where I was sitting. He approached me, still a little sleepy, and gave me a hug. I hugged him back and then told him I had a surprise. I had parked the car in our driveway and we have a sliding glass door that leads out to where the car was parked. I took him to the window and showed him his surprise. “Daddy! A NEW CAR! You got a new car!!! I LIKE it Daddy! It’s new! It’s little AND big! (He didn’t know how to say “medium” since it’s bigger than our old Nissan Altima yet smaller than our Pathfinder). Soon after, Swee’Pea appeared from her nap. After receiving my hug I asked TheMonk if he wanted to show Swee’Pea the “surprise.” After seeing the excited response from TheMonk, I was looking forward to seeing how excited Swee’Pea would be seeing the new car herself. “Look, Swee’Pea!” exclaimed TheMonk as he led his sister to the sliding glass door by holding her hand and pulling her. “It’s a surprise… LOOK! DADDY GOT A NEW CAR!” he yelled as he jumped out of the way to give Swee’Pea an unobstructed view. We both watched for Swee’Pea’s reaction. She stood there, silent for a brief second, taking it all in. I could see her face scan the length of the car and I awaited her surely enthusiastic response to seeing this beautiful car in the drive way. “Huh.” was her monosyllabic response. The expression on her face never changed. Within seconds of seeing the car for the first time, she spun around and headed for the couch in the family room, climbed onto the couch and buried herself in a blanket and began watching TV. Leaving TheMonk and I to soak in what had just happened. I guess a new car just isn’t her cup of tea.